D E S C R I P T I O N : This sculpture is designed to be a seat, the pose playful and fanciful like the Frog Prince in stories. The eyes are stainless steel, letting children see their reflection in his eyes..
D E S C R I P T I O N : Grace is named for the gracefulness of the giraffe as well as the design. I morphed two of her feet together (separated by a line) to create a graceful line the eye can follow up the form to the leaf at the top. She resides at a children’s camp in Wimberley, Texas. D E S C R I P T I O N : In this piece, originally created for a collector, the wings unfold in the shape of a heart. The designs are Art Nouveau-inspired with polished circles that capture the colors and light of its surroundings. The heron is proud in its pose, exposing the strong designs on the chest. 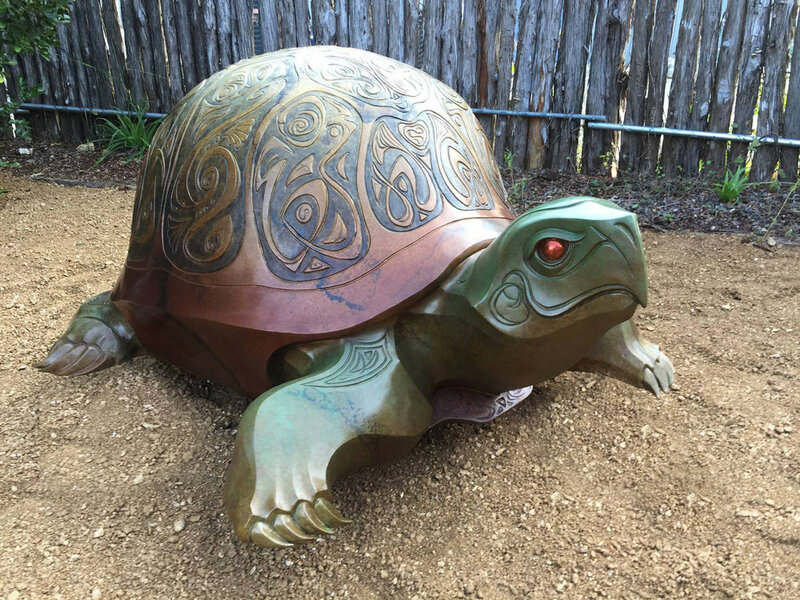 D E S C R I P T I O N : A box turtle-inspired seat, this piece was commissioned and resides in the Family Garden at the Lady Bird Johnson Wildflower Center in Austin, Texas. The designs are very moving and fanciful highlighting the sweet face and polished stainless steel eyes of the Peaceful Warrior. 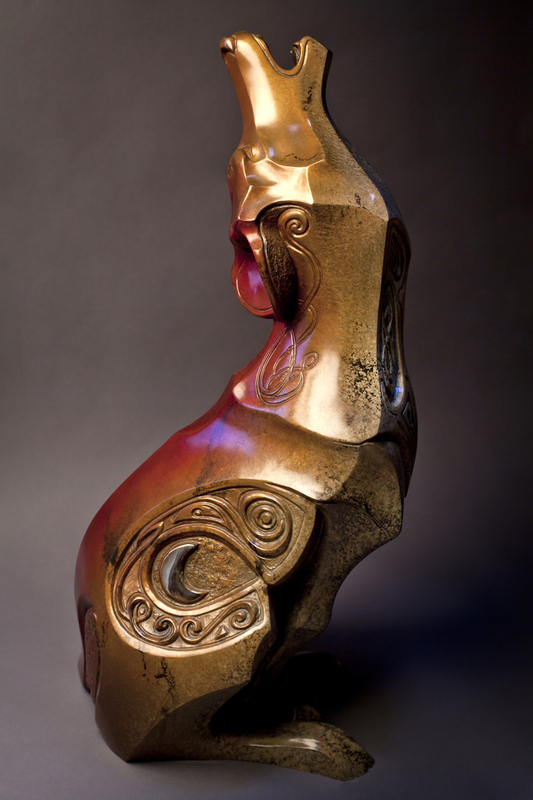 This piece is named for the Native American lore of the powerful but gentle warrior spirit of the turtle. D E S C R I P T I O N : One collector described the pose of Night Song as ‘howling from his soul.’ The designs on the chest are Celtic in nature, creating a shield protecting the exposed neck. The body designs represent the seasons swirling around the polished crescent moon, while on the back of the head is a polished full moon. Behind the ear is a design representing his song, very free-form. 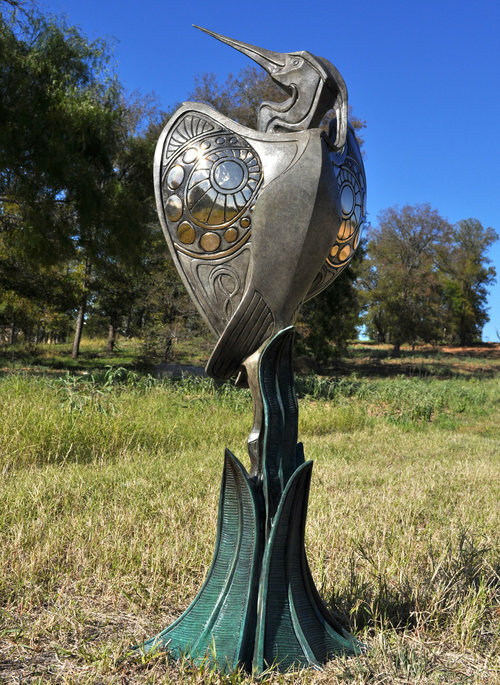 In 2017, Night Song was selected for permanent installation by the City of Bastrop, Texas. D E S C R I P T I O N : Roxy is based on a fox I saw in a very sassy pose. Her appeal and charm show through as well as the crisp lines of the body leading the eye all around the sculpture. Her tail tip and the fronts of her ears are polished to show the bronze beneath adding a real flare to her. On her chest is a heart, a common theme in my work. I create stylized animals in bronze at various scales. My work is sold in galleries around the country and installed as various monuments around Austin, Texas and beyond. I've worked as exhibit designer and artist-in-residence at the Texas Memorial Museum at the University of Texas at Austin since 2000. I've also been involved in two Dino Pit projects, one for the Austin Nature and Science Center and the other for Williamson County. I'm proud to be a member of the Texas Sculpture Association and the Texas Society of Sculptors. Before moving to Austin, I was exhibit designer and artist-in-residence at Yale University’s Peabody Museum of Natural History in New Haven, Connecticut for twelve years. My sculptures reflect my influences of working in the museum world for the past twenty-seven years. The stylized forms are based in Art Deco and Art Nouveau and the designs carved into them are influenced from Celtic, Tribal, Inuit, Polynesian, and Native American design and transformed into my own style. Movement, strength of pose, purity of line and form are how I approach creating my designs. The designs sometimes tell a story, convey the spirit of the animal, and describe the location of the animal’s origins. The beauty of monumental sculpture is the interactive component. My large Frog (Garden Prince), Turtle (Peaceful Warrior), and new Snail (Slow Journey) are all designed to be seats for kids and adults. I believe that being able to touch the forms and interact with them solidifies the appreciation of the work. My monumental works can be found on the University of Texas at Austin campus, Lady Bird Johnson Wildflower Center, Zilker Botanical Garden, Austin Nature & Science Center, Camp Swift in Bastrop, Downtown Bastrop Sculpture Project, Celina High School in Celina, Texas, and in a variety of private collector’s gardens. I currently sit on the Board of the Umlauf Sculpture Garden in Austin.